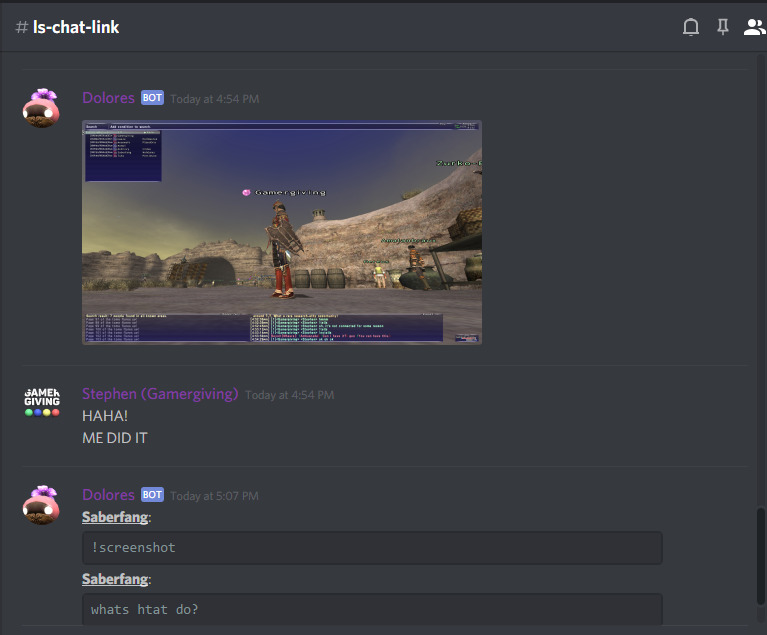 FFXI Discord Integration is finally here! Description: Connect your FFXI character to Discord! 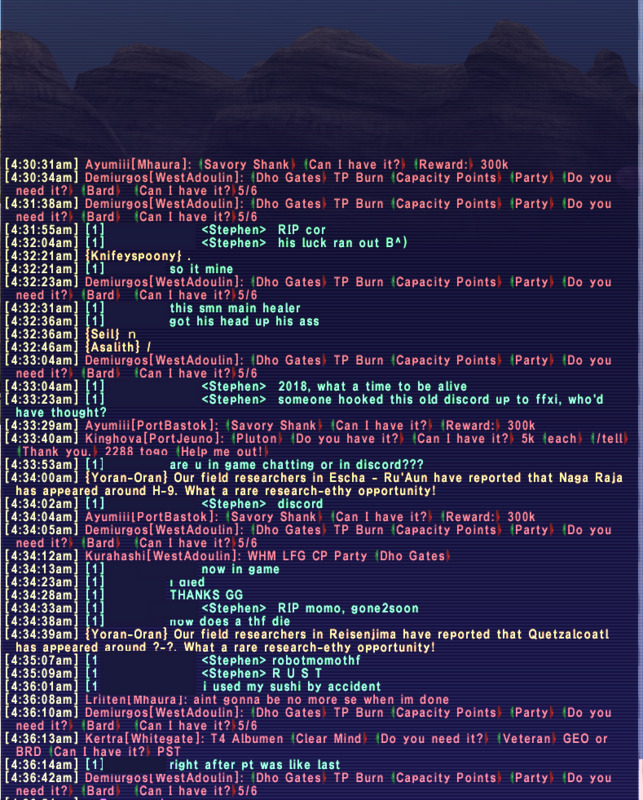 See and respond to FFXI shout, linkshell, and tell messages from Discord in near real time! 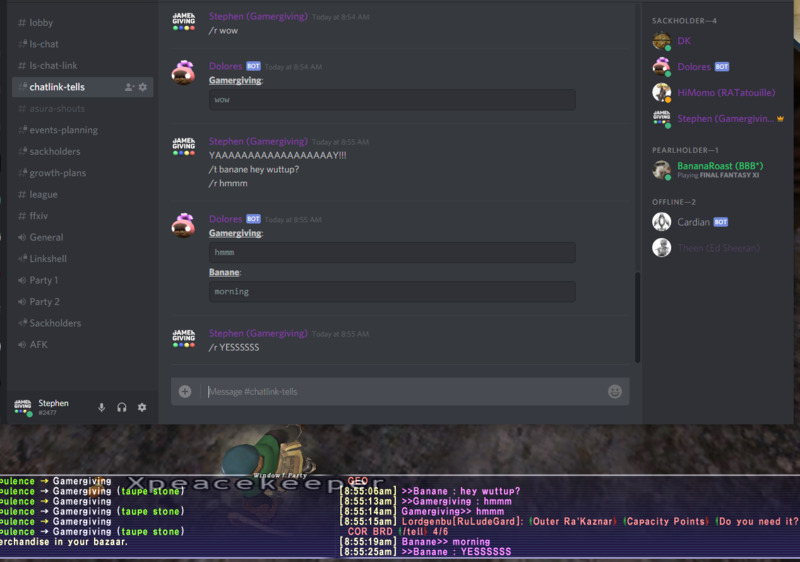 Uses both Windower addon (Cardian_Addon) and Discord bot (Cardian_Discord). -In-game Linkshell #1 messages relayed to Discord Linkshell channel. -In-game shouts relayed to Discord Shout channel. -In-game tells relayed to Discord Tells channel. -Any messages posted in Discord Linkshell channel relayed to Linkshell #1 in game. -Any messages in any channel (where bot is present) prefaced with "/l " relayed to Linkshell #1 in game. -Cardian_Bot can notify any Discord users of instances in shout/linkshell/tell of "Watch Words". Useful if looking to watch shouts for particular items for sale, content to join, etc. (Can also set your own name to see if some nerds are talking about you, you narcissist!) Set with "!watch <word or phrase>", unset with "!unwatch <word or phrase>". -Toggle channels on and off: "!tells" / "!notells", "!shouts" / "!noshouts", "!linkshell" / "!nolinkshell". -Multiple Cardian_Bots self-organize and schedule message checks based on priority lists. -Duplicate messages skipped based on user-supplied tolerance. Helps with shout spam and multiple Cardian_bots reporting messages. NOTE: This is an initial release. Development is ongoing. Let me know if you find something acting funny and I'll fix it! -DO NOT install Cardian_Discord in your Windower folder! -DO install Luvit and Discordia in your Cardian_Discord folder. -DO add your Cardian_Discord folder to PATH. -DO modify your cardian_discord/discord_info.lua file to reflect your personal Discord settings. looks good man. definitely interesting, will have to take a look. Looks great, but why u no ashita? I'm sure it can be done. I've never messed with Ashita myself, though. I can make it if enough demand, for sure. Using a batch file placed in the addon folder, user no longer has to manually start and stop the bot. Set the destination folder in the batch file and simply load and unload the addon through Windower. The Discord bot will start and stop automatically! 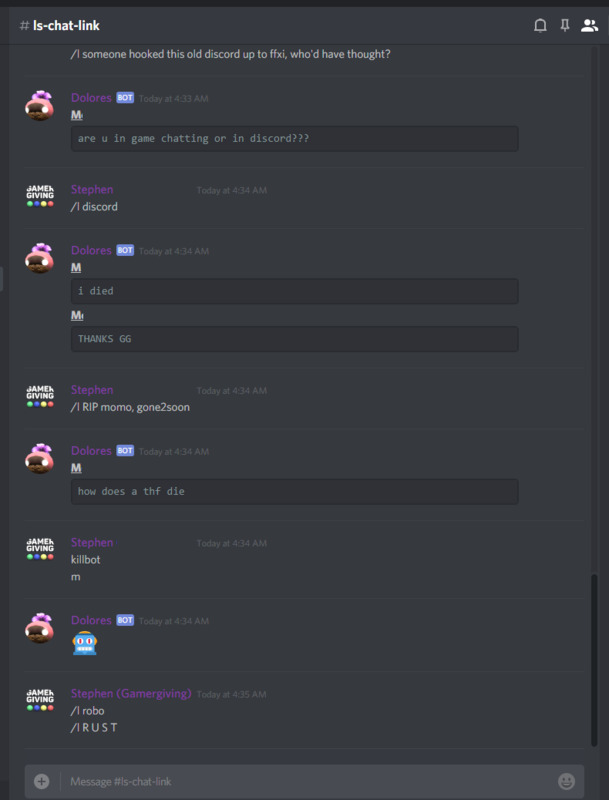 Anyone in Discord can issue a "!screenshot" command and the addon will take a screenshot and the bot uploads it to the channel where the request was made! Yup, going to mess around and get this up and running this week for the LS! Looks great Gamer....thank you bro! Some small -- but significant -- fixes. Previously, the person running Cardian_Addon's linkshell contributions didn't show up in Discord. This is because linkshell_in and linkshell_out are handled differently. They both parse and appear in Discord now. Previously, Cardian replaced anything between "<" and ">" with "<Discord Content>". This was to prevent showing user_id in linkshell (which Discord supplies when a user is pinged). It prevented running any FFXI commands using "<" and ">" from processing (<t>, <bt>, <hpp>, etc). This is fixed. It can now differentiate between Discord and FFXI "<" / ">" commands. Addressed a screenshot issue where the file name was incorrect so no action was taken. Can now reply to last /tell sender using "/r "! Cardian_Bot tracks the most recent /tell sender and allows you to reply to them using "/r"! This helps for replying to messages quickly without having to type out the whole recipient's name! Message longer than the maximum are split on the last whitespace before the max. Remaining message sent as additional message(s). Things like ":)" and ":D" would convert to Japanese characters in game. This is fixed by running the messages through a filter. The replacement, while still ugly (just a string of "?" for each character), is in English. Added the ability to define multiple bot admins in discord_info. Added the ability to have the bot report to multiple channels for shout/tell/linkshell messages. All error messages besides tell failure deemed superfluous as the rest are generated while user is playing. Removed. This is the first update that requires a new version of discord_info. I will generally try to avoid updating it but it was unavoidable to add this functionality without doing so. Apologies. Is there a way for multi-user integration? Like multiple people being able to whisper or talk to linkshell from their own character? Found a bug(? )..if you have the bat file set up so it loads the bot automatically when you load the addon, and then reload the addon in game it will launch another bot instance, and doubles up every incoming messages/outgoing command. I assume this means you can infinitely do this and that can cause either some major issues/crashing or possible exploits with the use of other addons. Do you have a discord we could use for a little support? You ever get a response to a discord help server? I'm at the last step of loading cardian_bot with luvit. CMD window opens and then closes. You'll probably need to double check that your Bot is completely active on the discord developer side and that your bots token information is correct. Info is correct, bot is inactive. I can see the addon txt files are pulling data from the game, just not translating it to discord. Happy to help, the setup can be a pain! It's worth it once it's all set! Hit me on Discord and we'll get it straightened out! I've begun work on Cardian 2.0. Conceptually, this is a beautiful project that I feel needs to exist. Programmatically, it's a mess that works through stubbornness and magic. I look forward to sharing the new one soon! Happy New Year, and Im looking forward to this!